Great Rann of Kutch is a seasonal salt marsh located in the Thar Desert in the Kutch District of Gujarat, India and the Sindh province of Pakistan. It is about 7,505.22 square kilometres (2,897.78 sq mi) in size and is reputed to be the largest salt desert in the world. This area has been inhabited by the Kutchi people. 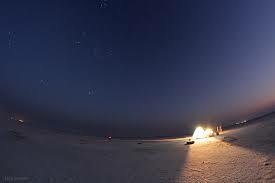 The name "Rann" comes from the Hindi word ran (रण) meaning "desert". The Hindi word is derived from Sanskrit/Vedic word iriṇa (इरिण) attested in the Rigveda and Mahābhārata. As early as 325 BCE, Alexander the Great was aware of the area. The Luni River, which originates in Rajasthan, drains into the desert in the northeast corner of the Rann. Other rivers feeding into the marsh include the Rupen from the east and the West Banas River from the northeast.